1. MagEyes360. Comfortable. Lightweight. Secure Full Headband. High grade optical quality lenses. Two-tone Titanium/Gray! Two lens powers Easy to change one lens power to another! Adjustable Lens Arm Up/Down! 2. Low Profile "Blue Jean" Cap/Hat imprinted with HatEyes on the front, mageyes.com on the right side. Adjustable for most head sizes, with "hook 'n loop" closure. Lightweight fabric with vent holes. 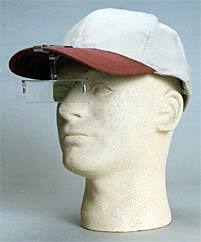 Great to wear with your HatEyes clip on magnifier. Click here for more info. 3. LED Light. Features Adjustable Angle light head, Clip on attachment for hands free usage, Ultra Bright LED light, Extensive Lifetime of LED (100,000 hrs. ), Lightweight/small size, Low Power consumption, Key Ring attached, Wrist Strap (camo colored) included, Battery Life - over 12 hrs., Uses 2 Lithium Batteries (CR 1220 3V), On/Off button. 4. You have asked for it! A small light to go with HatEyes! The MicroTorch Lamp is now available to complement the HatEyes magnifier for night use. Click here for more info. 5. 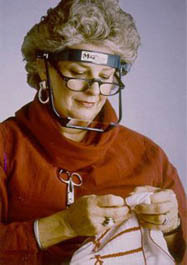 Also, we have had many requests for a "clip on your glasses" type of magnification. We are checking into the possibilities of this type of additional magnification. Please refer to this site for updates. The newest member of the MagEyes family!